Special thanks to Graham Neray and the MongoDB team for their contribution to this blog post. We’re excited to share that teams can now use the global cloud database MongoDB Atlas for free on Microsoft Azure. The newly available free tier on Azure is known as the M0, and grants users 512 MB of storage which is ideal for learning MongoDB, prototyping, and early development. This announcement is apart of our broader goal to give our customers immense choice and make it incredibly easy to get started on Azure for anyone in the world. The Atlas free tier will run the latest version of MongoDB, one of the most popular databases on the planet. Like larger MongoDB Atlas cluster types, M0 clusters can grant users optimal security with end-to-end encryption, high availability, and fully managed upgrades. M0 clusters also enable faster development by allowing teams to perform create, read, update, and delete (CRUD) operations against their data right from their browsers via the built-in Data Explorer. MongoDB Atlas on Azure is also tightly integrated with key Azure analytic offerings, including Power BI and Microsoft Azure Databricks. Creating a free tier is easy. 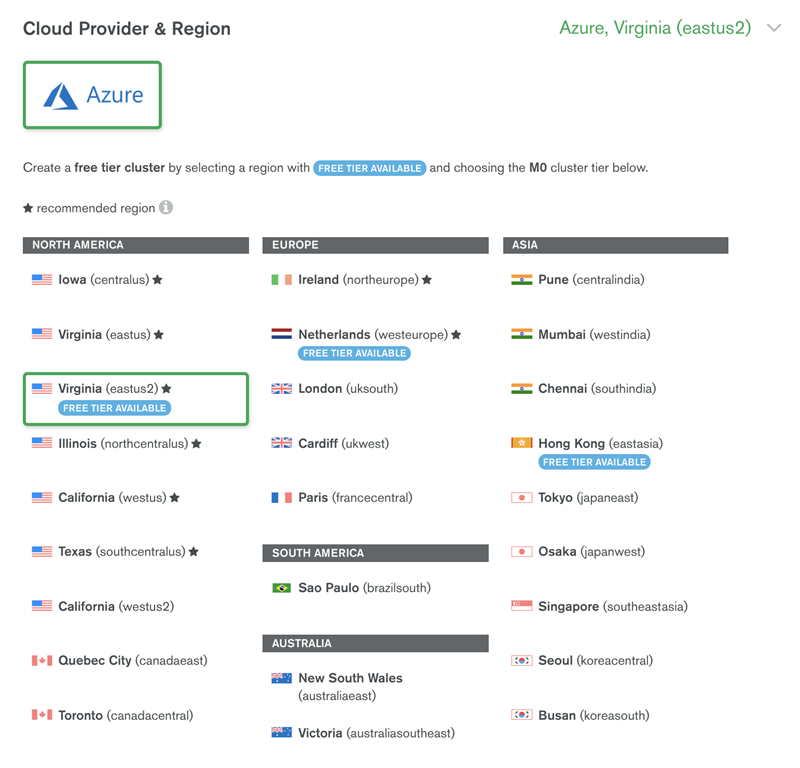 After signing up for MongoDB Atlas, select “Azure” as your cloud of choice and one of the regions above when building your first Atlas cluster. Next, select “M0” in the cluster tier dropdown.